A very reserved purchase. 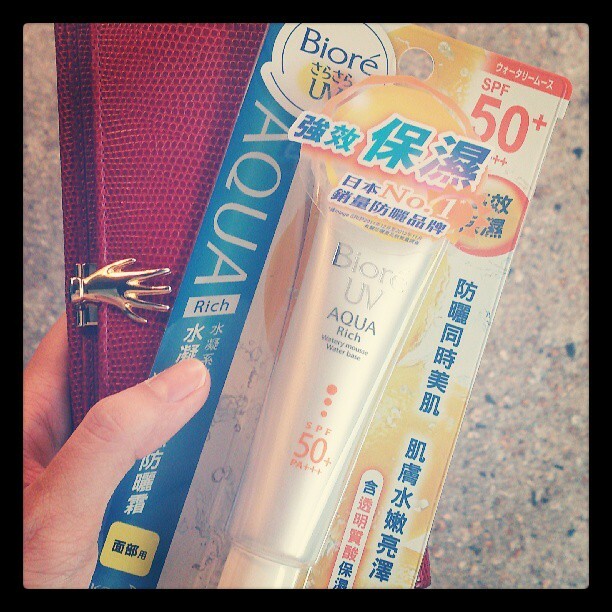 After downing a small travel size of the blue version (for face and body) - post link! - I decided this is Black Jacq material and had to repurchase. When I saw the double discounted price tag at Mannings, I gave in and picked up a silvery tube (for face). I am loving it! Replenished for Mr A, and giving one product a try myself. Sam sent me more stuff, after she realized she did not send 'enough' in the previous prize package. More on her generous craze in another post! Subscribed to three magazines and obtained a bag load of beauty products. I actually consider this a beauty shopping with free magazine subscription as gift, fair, no? Also, some lady at the Vivi counter told me Gla magazine is being discontinued by the Japan publisher, bad news; I really heart that. Mr A and I spent an afternoon strolling from one mall to another, ending up with a brush splurge at Lane Crawford (department store). Which is the first brush I acquired? Answer is on my Instagram, Twitter and Facebook. Should be counted in next week! Can't stop using this for 5 consecutive days. Its good size mirror and luxe case is a perfect touch up compact to carry along in my hand bag, too. Smells lovely, this gel-ish fluid replaces cleansing oil to remove my face make up. Leaves skin comfortable, fresh and soft! iamgrape1119 is back! Our beloved Tao has written an update post, finally. Head over and send her some love - she totally inspired me to 'seriously' blog. Kate Colorcious Diamond Eyeshadow Palette - link!